A few posts ago I put up the total rave banger "Mayhem" by Full On Sound, a very European sounding track (Germany, Belgium?) - but actually it was by two English lads - Morgan King and Nick Hook (Nick E.). They were quite good at doing early 90s style German techno, another of their aliases was Bassrace (and that appeared on the first Techno Trax compilation, a very influential double pack of vinyl for me). Well it seems a few years later, the two guys had done a 180 degree turn and headed down the progressive road. Nick in particular was an important player in the progressive scene early on, playing a big role in English labels OM and Whoop. As far as I know, he's still at it. 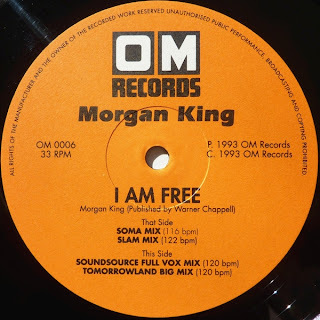 But this track is by Morgan King - who I believe dropped out from dance music not long after its initial release in 1991 (around the same time and on the same label as Mayhem) - and it's more of a classic than anything Nick Hook has put out. Many of you will know it from various Sasha and Digweed DJ mixes, but I'm only presenting the Slam/Soma mixes here. The 9 minute Soma Mix is the pick of the pack, quite slow and I used to pitch it up quite a lot. Don't think I'd debase it like that nowadays. i love this post, congratulations!!! !